Blantex Army - Style Bunkable Beds let you rack and stack your troops at the deer shack or cabin. Nothing beats having a real bed after a hard day on the trail or in the woods. Now you, and the rest of your crew, can have it with these Army-Style Bunkable Beds. 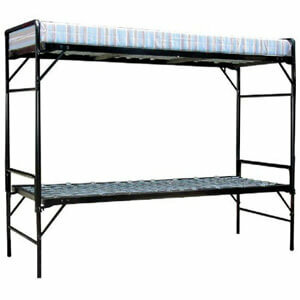 You get two beds and, for fast, easy, space-saving bunking, order the bunk adapters to stack your two beds together. Cool fact: this is the Blantex model used by the American Red Cross for Hurricane Katrina relief. Each Bunkable Bed features: 1-1/2 In. angle iron deck, with welded corners and 2 center supports; 1-1/8 In. round, 20 gauge cold rolled steel legs; 2 In. x 4 In. galvanized link spring deck; 4 In. foam mat is thick and comfortable; Dipped black paint finish; Each bed approx. 30 In. x 75 In. x 15 In. For real comfort, nothing beats having a real bed to sleep on. Order Today!